A version of this piece was published in The Sunday Times. From the feet and inches marked with pencil on plaster walls telling the stories of growing children, to the door that always creaked; the scratch in the floor; the tree in the garden planted by Grandad, or the noise the central heating makes; houses tell stories. Houses are remarkable storytellers — the cycle of family life — generations of births, marriages, and deaths, captured in bricks and mortar. Millions of mini-monuments to stories we may never hear spread across the cities, towns, and villages of the Island of Ireland. The narratives of generations past quietly whispering to us as we rush along the streets from A to B to C, staring at our palms. What might we learn if we took the time to listen? Here is one of those stories. Sixty-six years ago in 1952, a small, unassuming, white double-fronted bungalow was built in the Co. Kerry town of Tarbert. If you live locally you will know it as the house that Pat and Ailish Carey built, and following them another three generations of the Carey family. What began life as a regular bungalow— the kind you see in any Irish town — has become a small piece of family history and, hope the current owners, architects Brian and Barbara Carey, an important part of the conversation about the future of rural housing in Ireland. Between 1997 and 2005 Pat and Ailish Carey died. One chapter in the life of the house ended and a new one began. The transition in family life was marked by the bungalow growing into a modern two-story house designed by Brian and Barbara for Brian’s parents. 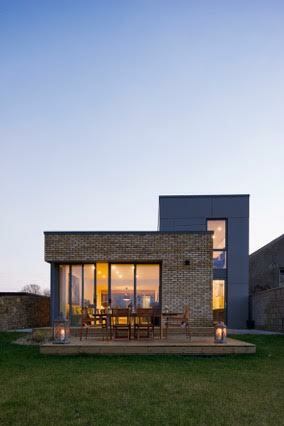 The brick and aluminum clad extension reaches out into the garden giving dramatic views towards the river. A south-facing courtyard cuts into the plan pulling light deep into rooms that would otherwise be artificially lit. A void above the kitchen linking through to a first-floor lounge opens up a space that would have felt claustrophobic. It’s a simple formula; natural light and open spaces — the result is a success. Between 2016 and 2017, the house changed again; this time to suit the needs of the next generation of Carey’s, Brian and Barbara’s two children Henry and Harper. The roof of the existing bungalow was remodeled to include a dorma, opening up the first floor to create what is now a large five-bedroom house. And the most recent addition — perhaps my most favorite — is a shed at the bottom of the garden, built by Brian with the help from some friends. Constructed out of cheap bitumen based corrugated sheeting and polycarbonate cladding it reflects something of the simplicity of the agricultural vernacular that surrounds the town. For Barbara, the story of the house is as important as the spaces, materials, and finishes. “There are things that are not perfect in the house for exactly that reason.” Where a lot of architects would want to hide the imperfections the Carey’s celebrate them. “The house wasn’t built by one person, it’s a whole bunch of different generations so you accept that things are maybe not perfect or as you would want them.” Something many architects could learn from.